For those who like to go au-naturel, our formula is not made with glycerin, parabens, fragrances, flavors or hormones. Packed with soothing botanical ingredients like aloe vera, chamomile and pectin (from fruit), just a touch of this lubricant feels like second nature. 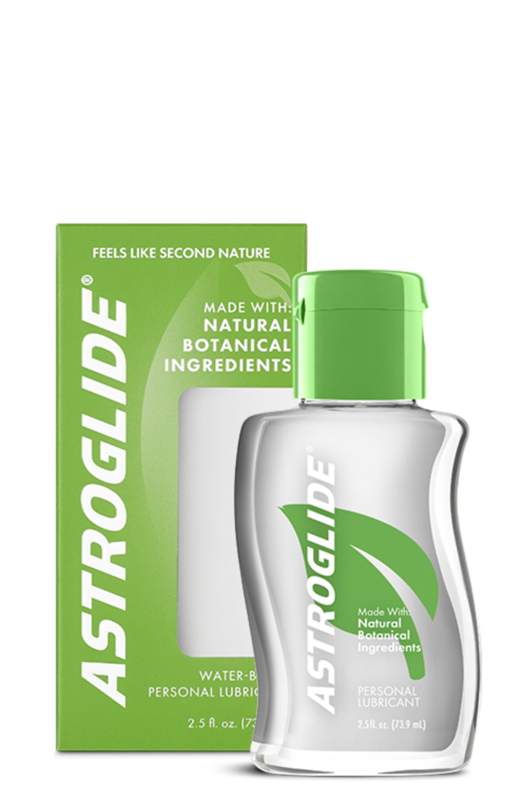 For those with vaginal dryness, Astroglide works just like our original formula to soothe and hydrate. *Compatible with natural rubber latex and polyisoprene condoms. Natural Liquid is rated 4.6 out of 5 by 272. Rated 5 out of 5 by 0000lisa from Not sticky! Perfect water based lube! It's Not sticky at all which is a huge plus! Rated 5 out of 5 by AustinJohn from Just like a fine oil lube! Wow full sensation and glides like water but with a bit of oil added. Not greasy and not a big sticky mess (at least not the lube). Incredible. Rated 5 out of 5 by Azul2148 from Fantastic! Free sample & it was awesome! Will be buying again...hubby & I both loved it! Rated 5 out of 5 by Kate16 from Very good! Im surprised with how natural it feels. I liked it very much and recommend. Rated 5 out of 5 by pbean74 from Loved my sample! I have some age related lubrication problems and this did the trick. Astroglide lubricants are safe, high-quality and super slick. See for yourself.